Young Thug also professed to being “a big fan of everything that” Kanye West does before speaking on another artist he looks up to. While the 21-year-old rapper has had the opportunity to work with Ye, he says Lil Wayne is the one artist he’d like to work with more than anyone in the world. He spoke briefly on the Young Money rapper when asked if the lyricist has served as an influence on his musical style. Currently signed to 1017 Brick Squad Records, Young Thug is rumored to be signing with Future’s Freebandz, but according to the rapper, the label move is one that may not happen. Prior to signing with the Gucci Mane-led 1017 Brick Squad Records, Young Thug released a handful of mixtapes including 2011’s I Came From Nothing. 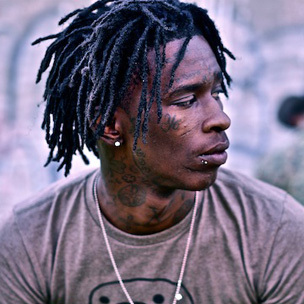 The rapper’s most recent release, 1017 Thug, includes guest appearances from Gucci Mane, Young Scooter, Maceo, and a number of other artists.